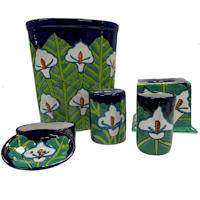 Mexican hand crafted Talavera ceramic bathroom sets. In the 16th century Talavera pottery was introduced to Mexico by the Spaniards. Mexico has been a country with a very rich culture and folklore. The combination of the Mexican folklore and the artistic designs from the Spanish Talavera created a unique look for this form of art that has trascended the centuries. Its main feature is its colorful finish. 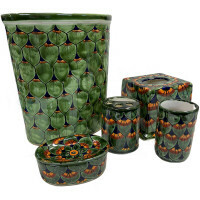 To view more details about a particular arts & crafts, art deco or folk art item, click on the corresponding image. L: 9.5", W: 6.5", H: 11"